Want to add volume, definition, spikes, or your own style to your wigs? This shaping cream is for yo..
Blue Tape by Jon Renau measures 3 yards and helps secure your wig in place. It’s intended for use on.. Specially formulated to be used on synthetic fiber and human hair wigs and additions, HairUWear Cl.. The Pinkee Promise color ring loan program allows you to borrow a color ring from any of ou..
Leave-in synthetic wig conditioner that is specifically formulated to detangle and restore the healt.. Using tape to attach your wig or hairpiece is an easy, mess-free way to get a secure bond.&nb..
A strong hold finishing spray that you control. Variable spray settings let you choose the le..
Light hold setting spray that revitalizes curly or wavy wigs and hairpieces. Use after shampoo.. Using tape to attach your wig or hairpiece is an easy, mess-free way to get a secure..
Sized to meet TSA standards, the HairUWear 3.4 oz. Essential Care Kit is the ideal kit for the tra..
Three (3) fishnet open style wig caps in your choice of color: Black, Dark Brown, or Blonde (N.. Envy Hair Detox Anti-Bacterial Spray is like a reset button for your synthetic-hair wig. Spray away .. Enhance and prolong the beauty of heat-defiant (heat friendly) synthetic wigs and hair extensions ..
For human hair as well as heat-friendly synthetics. Heat Treat Thermal Spray is heat activated and e.. Protect your human hair investment with the Human Hair Brush by Envy. This wig-friendly brush .. Protect your human hair investment with the Human Hair Care Kit by Envy. This care kit contains mois..
NEW from Jon Renau! In Tone Violet Shampoo is used to remove unwanted yellow tones from .. IT STAYS by Sigvaris is a simple-to-use roll on body adhesive that is extremely gentle and ea.. Protect your investment and keep your human hair wigs and hairpieces in great condition longer by us..
Paddle Brush by Jon Renau detangles wet or dry hair leaving it soft and smooth. This brush features .. This brush is a must-have for your long and mid-length human hair wigs! Use this brush to blow dry y.. This complete kit will save you the time and effort in maintaining your wig. The kit contains.. This complete kit will save you the time and effort in maintaining your wig. The kit contains the f.. Wide Tooth Comb by Jon Renau is designed to detangle and smooth synthetic fiber. This comb fits comf..
Lace Let Go Adhesive Remover by Jon Renau helps release and remove adhesive from your lace front wig..
NEW from Jon Renau! Pure Repair Restoring Balm replenishes and revitalizes damaged alternative..
Red Adhesive Tape by Jon Renau measures 3 yards and helps secure your wig in place. It’s intended fo.. Envy Renu and Repair Glosser Spray brings your damaged wig back to life! Everyday wear and tea..
2 in 1 detangler and protectant that nourishes synthetic fibers for the all-day softness of a leave-.. Regular cleansing with our synthetic wig shampoo restores the salon body and extends the life of syn.. 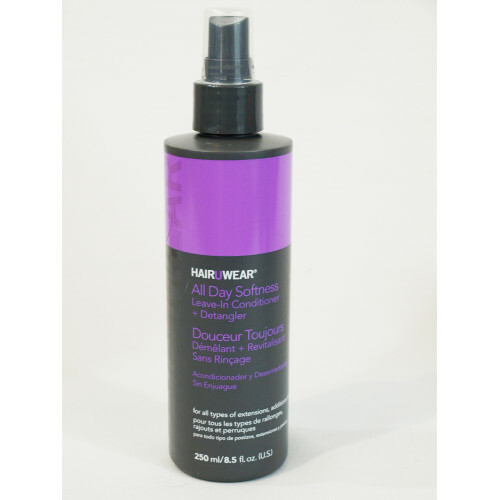 Medium hold styling spray for all types of wigs and hair extensions. This non-aerosol hair styli.. The Softie Wig Liner by Jon Renau is crafted with bamboo viscose, a soft and luxurious material that.. Recommended especially for today's wigs, the HairUWear styling comb will not damage fibers ..